A very grey weekend with dubious weather forecasts but one in which a surprising amount got done. 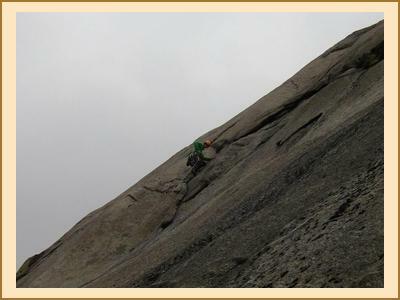 After reports of dry rock from Kenny & Alison Mike & Fiona had an alpine start on Saturday to beat the forecasted lunchtime rain. Blank on the Rosa Slabs was sucessfully ticked off and was followed up by visiting nearly every shop in Brodick. The rain never turned up until much later but it just means a return visit for the other routes on the slab will have to be done. 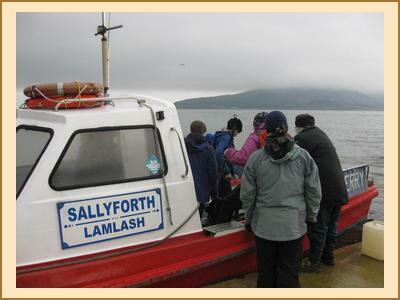 The "excellent" bus service (which was late) was used by the others to get to Glan Sannox. Martin & Ian had a good day out on Caisteall Abhail, Cir Mhor & Beinn Tarsuinn. Kenny, Alison, Nigel, Pauline, Dave and Marcus went up Goat Fell via Cioch na Oighe encountering hoards of charity walkers on the summit. In the evening Nigel impressed everyone with his gargantuan chinese take-away which easily provided those who were not quite full from their own meals with a top up! On sunday the promised rain turned up on schedule. As for the others, well Ian had a claggy ascent of Goat fell. Marcus managed a full scale search for his keys on the Sunday night after returning home to find them missing. Quite an achievement on his first meet especially as they were in his bag all the time! Another sociable and enjoyable meet. If only the weather had played ball.